This was a sleep regression on steroids (likely fueled by the shock of no longer being the baby) and after nearly three weeks of sleepless nights my husband and I practically collapsed to the floor and prayed for some relief. Our God send came in the form of colorful, sparkly, sticky smiley faces. I was desperate for something that would encourage her to go back to sleep when she woke up at night without crying. I was certain that sticker charts were just too mature a concept for her at just 19 months, but anything was worth a try at this point. I started with a simple sticker chart that I hand made (similar to this one Sleepy Time Chart.) Layla earned a sticker for waking up, taking a nap, and laying down for bed without a hysterical melt down. I kid you not- this got her back on track within two days! Boy, did I feel like an idiot for not starting this sooner. 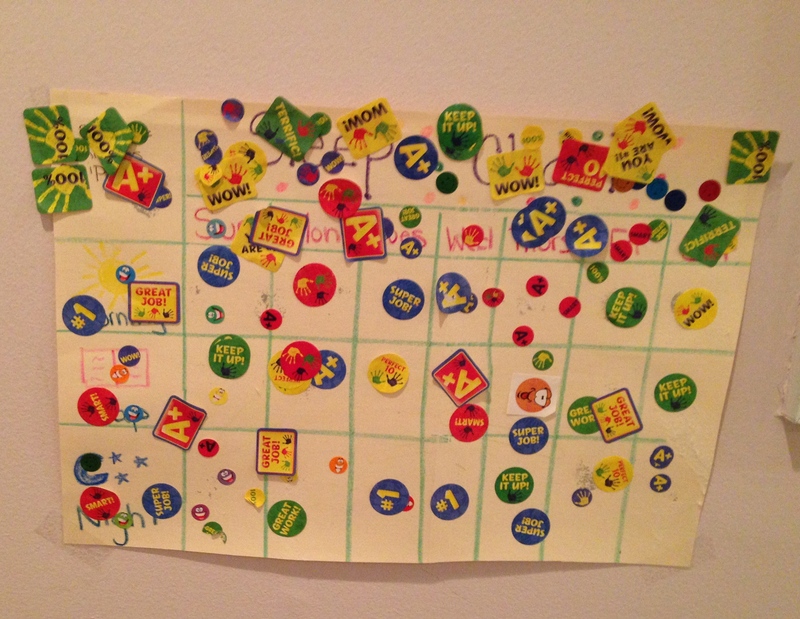 I have tried to switch her chart out for a new one, but as you can see below she has gotten very attached to this one, and refuses to get rid of it (which explains the hundreds of stickers stuck wherever she can find any empty space). Whatever works. Don’t make my mistake friends! 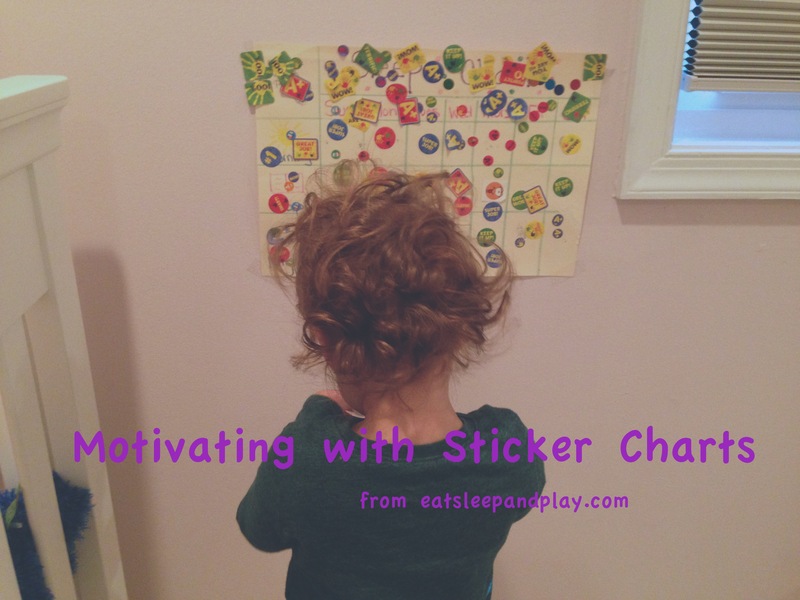 Below are five sticker chart resources that I use and love. All of these are FREE and PRINTABLE! I do not wish a screaming toddler on anyone, but if when you find yourself in a rough spot with them, give one of these charts a try! Is your child technology driven? There are also apps available for your phone or tablet that work just like a sticker chart (I reviewed quite a few- iRewardChart was the clear winner, but you have to purchase the premium version for more than one child). There is also a fantastic website classdojo.com that allows you to give kids “points” (or take them away) based on specific goals you set for them. This site is geared towards teachers, but can certainly be used by parents. Both of these sites are great, but I think toddlers respond better to actually holding a sticker that they earned! 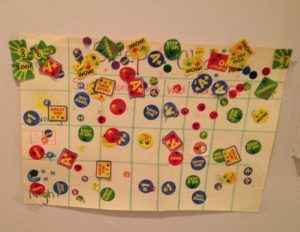 Do you use sticker charts at home? What goals do you use them to help your child reach?